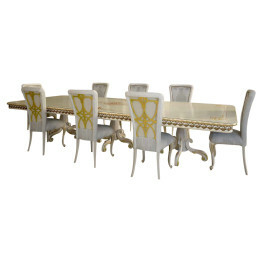 Elegant formal Italian dining set. Made 100% in Italy by skilled Italian craftsmen with generations of technique and furniture building experience. Rectangular dining table featured in this picture is made of carefully selected hardwoods and your choice of a custom hand finished color. Our Isabella Dining Collection is handcrafted using centuries old techniques passed down by generations of Italian Artisans. White Lacquer with Gold Leafed Scrolling help to demonstrate the exemplary craftsmanship that goes into Guerra Vannis furniture. 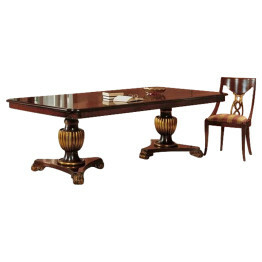 The Isabella Dining Collection Table when fully extended will accommodate 18 to 20 people. The three pedestals stay in place and the top of the table slides open using a special mechanism that allows for ease of use. This is truly a remarkable table that has been one of our most popular tables to date since it debuted in Milan, Italy last April. 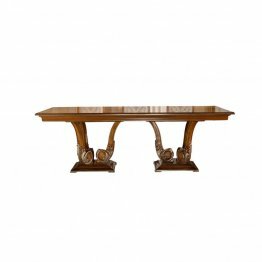 The Noblesse Dining Collection has beautifully hand carved bases and the collection is handcrafted in Italy by artisans that have honed their craft over multiple generations. It comes in a variety of finishes but was shown at the Milan Fair in walnut as it is pictured. This has been a very popular collection and will only be available for a limited time. 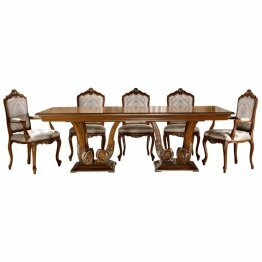 This Dining table is 98″ in length plus two 20″ extensions allow it to extend to 138″, which will comfortably seat 12 fully extended. For a more snug fit, this table will seat 14 fully extended.